There are a multitude of decisions to be made when building a house. One important decision that can impact your home for years to come is the electrical components. While it might not be a subject you are extremely enthusiastic about, it is vital to the functionality and safety of your home. Do a walk-through of your new home during the building process and determine where you will put your plugs and switches. Also figure out where you want your overhead lights, if you want ceiling fans, and any other related electrical features. It is important to determine this now to save pain and frustration later. All electrical wires run through a device called a “home run.” The wires go down into a junction box. The wires that are above the home run are called “spaghetti.” They get their name from the fact there are frequently a number of wires running through a home run. The resulting wiring above the home run actually looks a bit like spaghetti. Make sure nail plates are in place. This is a metal piece that goes over the frame where the electrical work is threaded. This not only protects your electrical work, it also protects you if you would pound a nail through the dry wall and into the frame of your home where the electrical work is. Not all homes have this important safety feature, but make sure yours does so there are no tragedies down the road. While most people realize that traditional insulation, such as large sheets of fiberglass insulation, are important, there are also other areas that need plugged up during the building process. Anywhere small holes may be present, such as spots for electrical wiring or an electrical box, use expanded foam. This small amount of foam insulation prevents cold air from seeping into the home from small areas you might not expect. While it is possible to install a ceiling fan after a home is built, it is even better to put the proper reinforcements in during the building process to have as secure of a ceiling fan as possible. Bolting the fan to the ceiling joist gives it a firm and secure fit. This prevents any wobbling or the fan from even falling on the home occupants. A great time to determine where you want your light to radiate into your home is when you build your home. The builder will place “cans” that give that particular area the structure and form that it needs for the proper lighting. 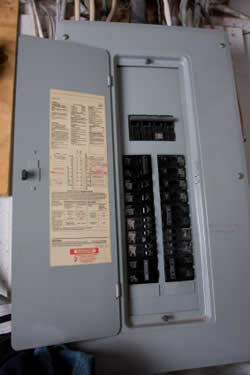 Make sure you label what each breaker goes to in your breaker box as soon as possible. It makes fixing problem breakers much easier down the road. It cuts out the step of trying to determine exactly where the problem is and allows you to fix it as quickly as possible. Also make sure you leave some blanks in your electrical box. This allows for future expansions in your home and gives you an appropriate spot to put new electrical lines in the future if you need to do so. 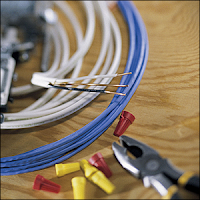 There are a number of areas in your new home that you need to consider when it comes to electrical wiring. A few quick and easy decisions early in the building process will do much for a smoother transition as your home progresses.